All through summer I've been a fan of pastel colours for my nails. But as soon as the temperature dropped I reached for the dark, moody colours again. I'm a massive fan of dark, deep reds in particular. 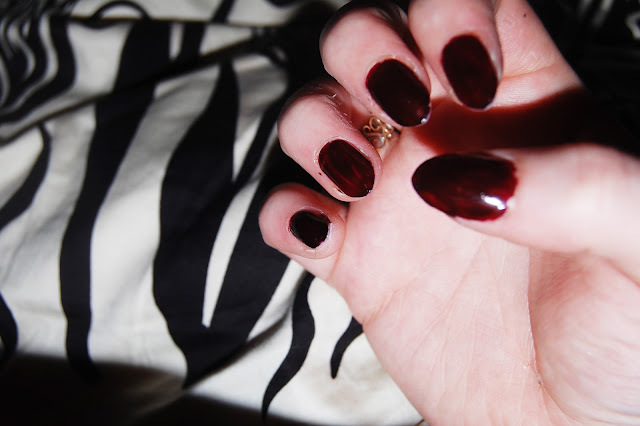 This red looks almost black. And I can't get enough of it. I'm really not using any other colours on my nails at the moment, apart from the occasional navy or turquoise. It goes with everything in my wardrobe which to be honest is dark this season anyway, and it looks quite classy too. I found this nail varnish in Boots. It's by L'oreal and the nail varnishes go on really well. It only took one coat for this colour, dried quickly and I find it doesn't really chip at all for me. 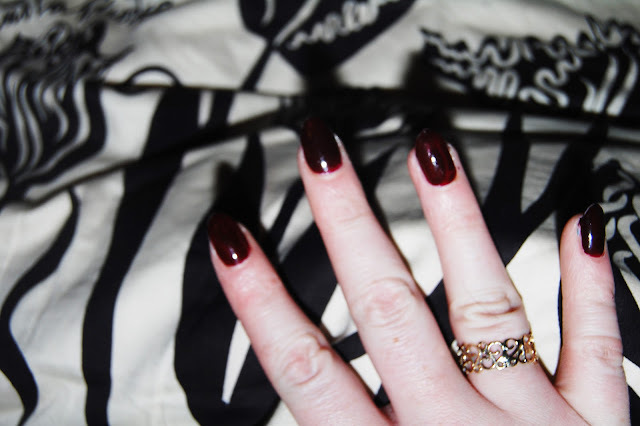 I'd really recommend the L'oreal Colour Riche Nail colour for anyone. Finally, I like to accessorise my nails with gold jewellery for a pretty finish! What's your favourite nail colour for the winter months? Scarlett Vamp Colour - L'oreal Colour Riche.